An upgraded version of Orbital ATK’s commercially developed Antares rocket has at last rolled out to its launch pad on the Virginia shore – thus paving the path for a high stakes first stage engine test looming “in the next few weeks,” according to the aerospace firm. “This stage test paradigm is a design verification test, said Kurt Eberly, Orbital ATK Antares deputy program manager, in an interview with Universe Today. The rocket will be erected at the pad during the full power hot fire test which is scheduled to last approximately 30 seconds. Hold down restraints will keep the rocket firmly anchored at the pad. Indeed the significance of the hot fire engine test cannot be overstated because the entire future of Antares as a viable launch vehicle and resuming delivery of NASA cargo to the International Space Station (ISS) depends on a successful outcome of the crucial test firing – following a devastating launch failure 19 months ago. Orbital ATK hopes to restart resupply missions to the crews living aboard the space station as soon as July – less than two months from today. The now revamped launch vehicle dubbed Antares 230 has been re-engined and upgraded with a pair of modern new first stage engines, the Russian-built RD-181 fueled by LOX/kerosene. To prepare for the upcoming stage test, workers carefully assembled and thoroughly tested an Antares first stage equipped with the new RD-181 engines. On May 12, 2016, they moved the vehicle on a dedicated multi-wheeled transporter from the Horizontal Integration Facility at NASA’s Wallops Flight Facility to Virginia Space’s Mid-Atlantic Regional Spaceport Pad-0A about a mile away. The team has about 3 weeks of check out work to complete before the live firing, including a wet dress rehearsal (WDR). “The team will continue to work meticulously as they begin final integration and check outs on the pad and several readiness reviews prior to the test. The window for the stage test will be over multiple days to ensure technical and weather conditions are acceptable,” noted Orbital ATK in a statement. The ‘Return to Flight’ blastoff – currently planned for as soon as July 2016 – will be the first for the private Antares rocket since a catastrophic launch failure on Oct. 28, 2014, just seconds after liftoff from Wallops. That flight was carrying Orbital ATK’s Cygnus cargo freighter on the critical Orb-3 resupply mission for NASA to the space station. Top Orbital ATK management soon decided to ditch the AJ26s, which were 40 year old refurbished engines, originally built during the Soviet era and originally known as the NK-33. They sought a replacement and eventually decided to upgrade Antares by powering it with a pair of new Russian-made RD-181 main stage engines and modifying the first stage core structure to accommodate the new engines. 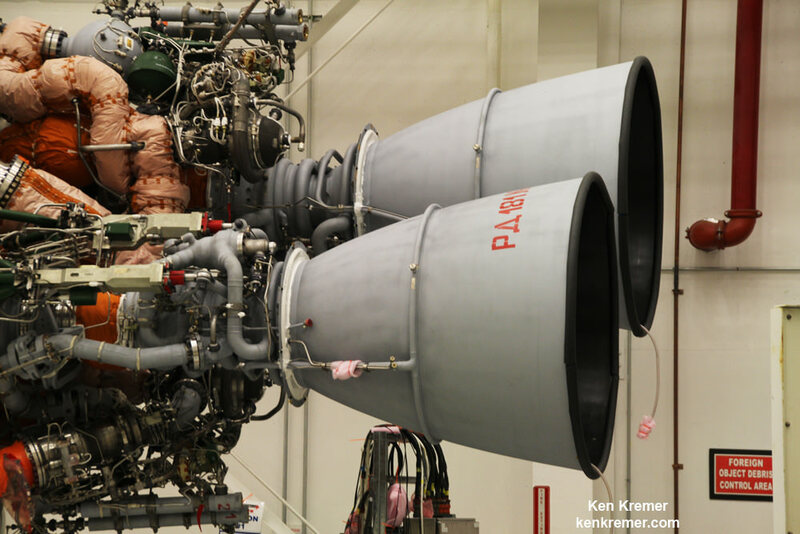 The RD-181 flight engines are built by Energomash in Russia. “They are a good drop in replacement for the AJ26. And they offer 13% higher thrust compared to the AJ26,” Eberly noted. Independent review teams have also been brought in to ensure that no stone is left unturned and everything is being done to achieve success. Now it’s time for the real deal. After all the hard work Antares is now at the pad. If the WDR goes well, the full up engine test will follow. “Then we will do the stage test,” Eberly explained. The vehicle and pad will be outfitted with lots of special instrumentation to gather as much test data as possible. “We will have a lot of accelerometers and extra instrumentation and extra microphones on the test article and around the pad. The test uses the first stage core planned to launch the OA-7 mission late this year. After the engine test is completed, the stage will be rolled back to the HIF and a new stage fully integrated with the Cygnus will be rolled out to the pad for the OA-5 ‘Return to Flight’ mission as soon as July. They utilized the United Launch Alliance (ULA) Atlas V rocket to deliver two Cygnus resupply vessels to the ISS on the OA-4 flight in Dec. 2015 and OA-6 flight in March 2016.